For baby boomers with highly valued properties, the new swath of proprietary reverse mortgage offerings may be something to take a closer look at. This is according to a new spotlight for those proprietary loans found on NextAvenue, a website aimed at the baby boomer generation owned and operated by the Public Broadcasting Service (PBS). One of the things driving the increased prevalence of proprietary reverse mortgage offerings is the continuously changing landscape of government regulation surrounding Home Equity Conversion Mortgages (HECMs), the product insured by the Federal Housing Administration (FHA). “Reverse mortgages are one of the top regulated products and every time the government changes the rules, the lenders have to change how they market it, who they sell it to and how they offer advice,” said Jamie Hopkins, director of retirement research at Carson Group. Without the regulatory limitations placed on HECM offerings, NextAvenue notes the entry into the proprietary space by several companies, including Finance of America Reverse (FAR) and their HomeSafe Select product and One Reverse Mortgage’s Home Equity Loan Organizer (HELO). Still, NextAvenue echoes the voices of lenders and financial advisers in recommending that receptive potential customers do their homework before engaging in a proprietary reverse mortgage. 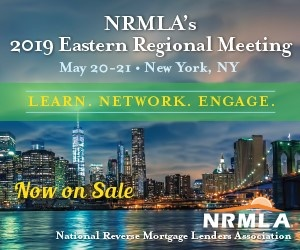 NextAvenue also advises due-diligence in finding a reputable lender, explicitly recommending one that is a member of the National Reverse Mortgage Lenders Association (NRMLA). Also, since counseling isn’t mandatory for jumbo products the same way it is for government-insured options, be sure to understand all of the accompanying terms and conditions before borrowing, the site says. “If your lender can’t answer your questions, look for a different one,” the article notes. Read the full article at NextAvenue.